The Standing Stone: Guest Post: "Chamber-towers not ‘hall-houses’! Time to accept the change" by Dr. Karen Dempsey. Guest Post: "Chamber-towers not ‘hall-houses’! Time to accept the change" by Dr. Karen Dempsey. Anglo-Norman castles in Ireland are typically earthwork and/or masonry structures of varying shapes and sizes ranging from very large complexes to smaller buildings. It is the smaller scale castles of the thirteenth century that we are going to look at today. These buildings, formerly described as ‘hall-houses’, comprise a rectangular two-storeyed block with a first-floor entrance that provided access into a single open space at first-floor level (Fig. 1). The interpretation of these buildings has recently been a contentious topic in Irish castle-studies (see O’Keeffe 2013). Although, the architectural description outlined above is accurate, the previous understanding of the function – how these buildings were used in the past by people – is incredibly problematic. 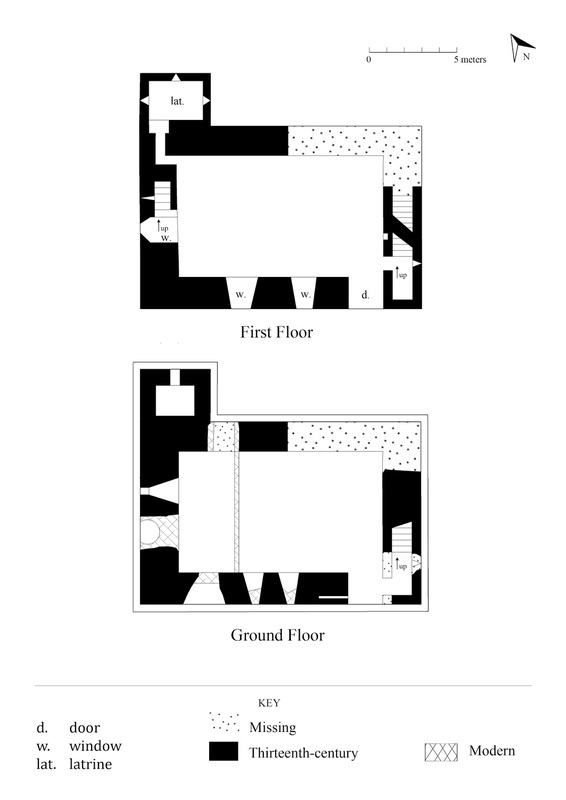 In brief, the ‘hall-house’ was believed to have contained a hall at first-floor level (McNeill 1997; Sweetman 1999; Manning 2009; Barry 2010). This is incorrect and the following blog demonstrates how we know this to be so. Anglo-Norman castle complexes contained a number of buildings, the most important of which were the hall and the chamber. During the twelfth century, the hall and chamber were contained within the same structure – a large donjon. 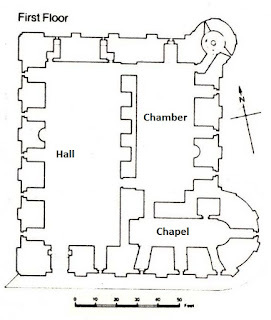 This typically comprised a large tower where the hall and chamber were positioned side by side at first-floor level but separated by either a timber or masonry arcade or with the chamber placed above the hall (Fig. 2). 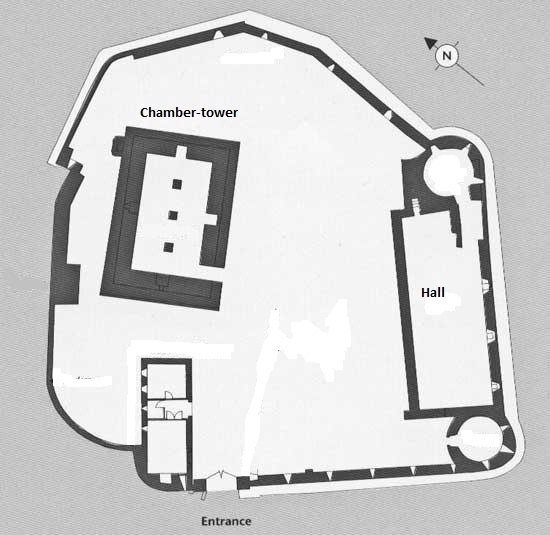 Figure 2 Plan of Tower of London. Hall and chamber at first-floor level. These castles were common in England and France during the twelfth century but they are very rare in Ireland. 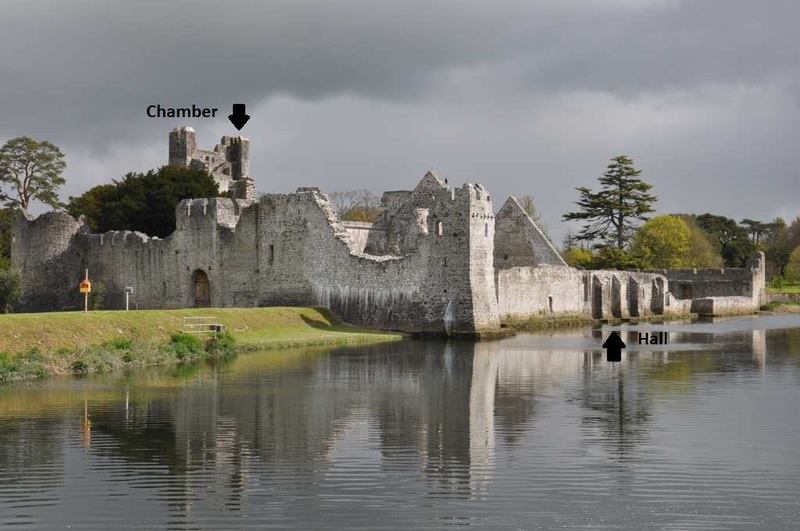 Only two examples of an Anglo-Norman donjon where the hall and chamber occur together at first-floor level in one structure are known in Ireland: Trim, Co. Meath and Maynooth, Co. Kildare (Fig. 3). Both were constructed in the later twelfth century (Sweetman 1978; O’Keeffe 2013). By the thirteenth century the separation of the hall and chamber became apparent both in Ireland and the rest of the Anglo-Norman world. 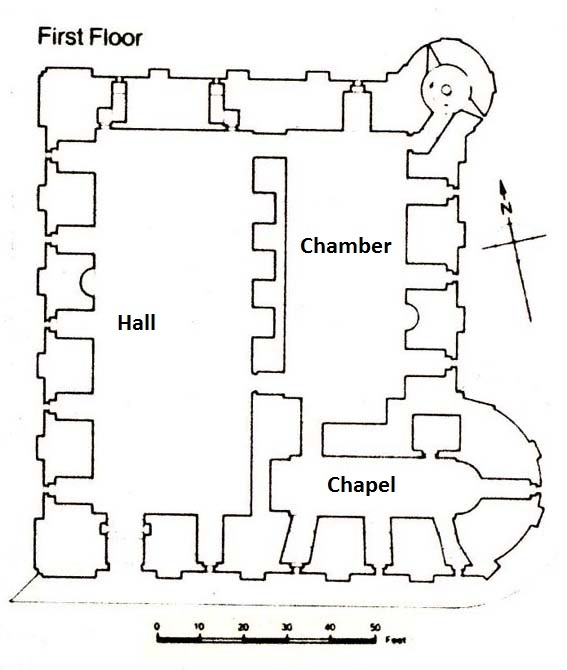 Figure 3 Maynooth Castle: hall and chamber at first-floor level (after O'Keeffe 2013). In Ireland most castles from the thirteenth century contained a separate hall and separate chamber (Fig. 4). During this period the chamber was the most visible structure within the castle complex as it was typically two storeys or more and often in a central location. The hall was usually located along a side wall of the castle complex. Both buildings were physically dominant within the castle complex although the chamber was the more prominent of the two. The hall and chamber were complimentary spaces and acted in partnership. 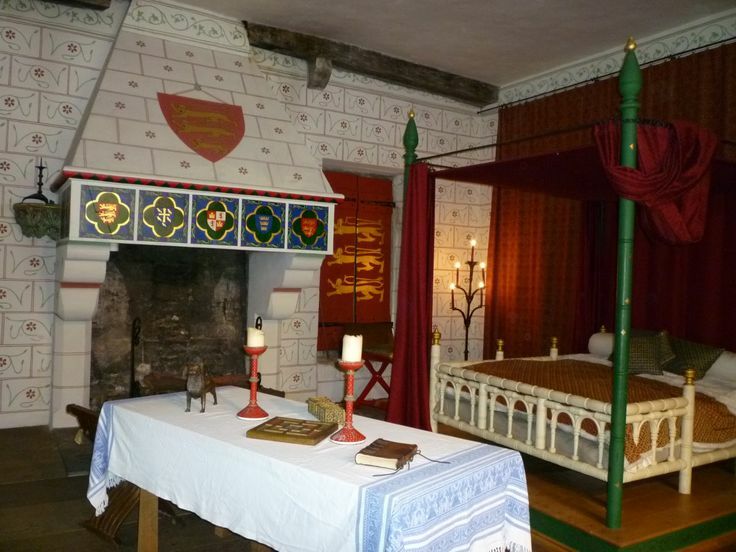 The medieval hall is understood as a ‘public’ space where the lord and lady carried out their seigneurial (lordly) duties and the medieval chamber as ‘private’ where they could retreat from ‘public’ life. Understandings of privacy in the medieval world were certainly different to our own modern views. Privacy for us might mean being by ourselves; however, for the lord and lady, we believe privacy was very different. It meant not being in full view of their entire household or indeed the inhabitants of the lord’s manor. These two buildings through their architecture and function shaped the lives of the people who interacted with them. As mentioned above the medieval chamber was the most prominent building of the castle-complex. It was constructed of stone and typically two-storeys in height (though could be more). Its main habitation space was positioned at first-floor level and contained access to latrines. Although the chamber did not have a set architectural form they are predominantly square or rectangular; however, there are a number of circular examples, for example Dublin Castle or the lesser known Mocollop, Co. Waterford. The chamber-tower could also contain a number of floors, for example, the large donjon at Carrickfergus or the smaller chamber-tower at Kinlough (Fig. 5). The medieval hall of a castle complex had a unique architectural signature: and there is little room to confuse this structure with the residential space of the chamber. It was rectangular in plan with dimensions of 2:1, positioned at ground-floor level with a central hearth or prominent fireplace. It contained opposing entrances usually in the long walls with a significant emphasis on fenestration (Fig. 6). In other words, windows were an incredibly important part of a medieval hall. They were very large and often contained seats at the base of the window in the thickness of the wall. A services area was located at one end of the hall. It contained the buttery and pantry, two rooms that contained all the wet and dry goods of a medieval household: linen, flour and items such as candlesticks for the pantry and beer for the buttery (Gardiner 2008). An access passage to an external kitchen eventually developed between these two rooms. This services end was considered the low status end of the hall which contrasted with the area where the lord sat, the raised dais – and elevated platform where the lord and lady sat – also known as the ‘high end’. 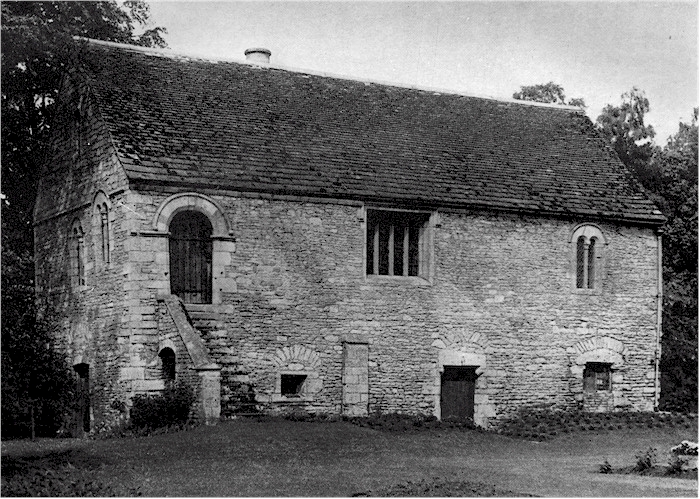 A medieval hall typically operated as the administrative and social centre of a lord’s estate. The medieval hall facilitated the public side of the lord and lady’s life where they carried out the duties that their position commanded. In other words, it acted as a venue where the public rituals of the lord and lady’s role could be acted out. The hall was a venue for ceremony and fealty (the act of showing allegiance) which included sharing meals, administering justice, and estate management. It was where the feasting, dining and entertainment happened. 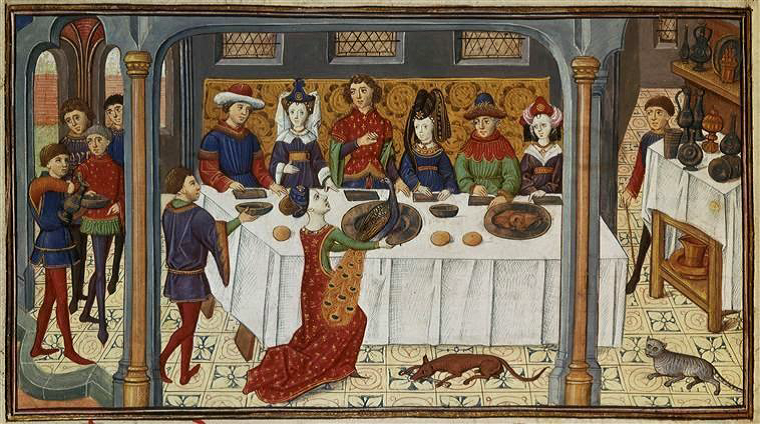 We can all imagine a medieval feast with a big fire and lots different plates of food on show (Fig. 7). 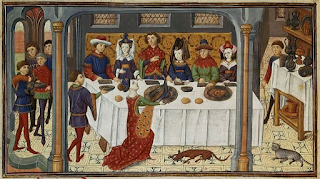 The medieval chamber, its partner, functioned as a private residential space where the lord and lady could retreat from the medieval halls to be alone (in the medieval sense) or with a selected few from their household (Fig. 8). Although they were not truly alone in the modern sense but they were removed from their ‘public’ life. The chamber building as part of the medieval castle complex has survived with over hundred examples of various ranks known. However, the survival of medieval halls is rare in Ireland with just over ten examples surviving above ground level. Those that do survive are quite ruined despite being constructed of masonry. These halls belonged to very high-ranking lords and are found at castles such as Adare, Co. Limerick (Fig. 9) and Athenry, Co. Galway (Fig.10). It is believed that halls below this level of Anglo-Norman society were constructed of timber with a stone foundation – a pattern also found in England. Therefore, owing to Ireland’s climate (among other reasons) these do not survive above ground level. This apparent lack of medieval halls has certainly hampered past understandings of castles. 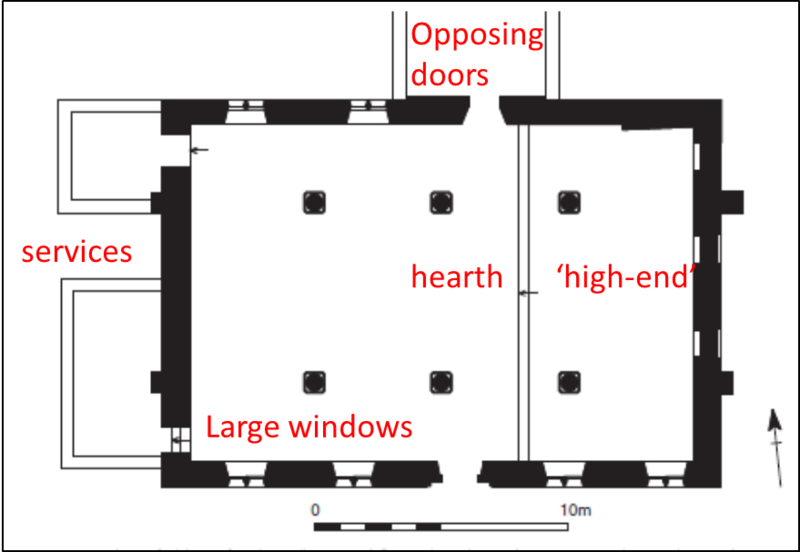 There appears to have been an assumption made that the surviving upstanding structures at a number of castle sites were halls not chambers despite not fitting the typical criteria of medieval halls as outlined above. It may be from this assumption that we see the emergence of the term ‘hall-house’. As we have seen the architecture and function of a medieval hall and chamber were somewhat different. 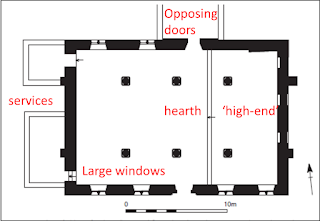 We can also see that the medieval hall had a very clear architectural signature: positioned at ground floor, and also, crucially, it contained a central hearth. The ‘hall-house’ was understood to have contained a hall a first-floor level but as we now know given the architectural signature of an actual medieval hall this seems to be highly unlikely. These ‘hall-houses’ - are actually chambers – private residences of lords – they do not contain a central hearth, they have first-floor entrances and no easily identifiable high or low end. Access it quite restricted making them an unlikely candidate for a medieval hall and typically there internal dimensions are not very large (Fig. 11). 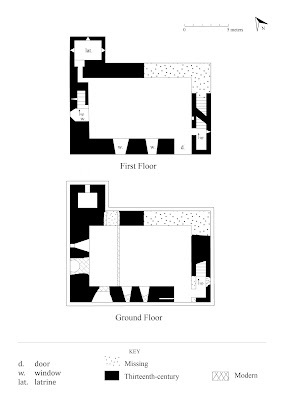 Figure 11 Plan of Annaghkeen Castle, Co. Galway. Clear indication of latrine and first floor entrance. This ‘new’ understanding is not novel but its application in Ireland is innovative. Dr. John Blair identified this problem (the misidentification of these chamber-towers as medieval halls) in England during the early 1990s (Blair 1999). 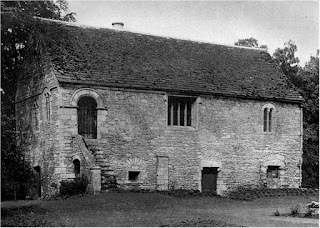 In fact, in England (and France) it is generally accepted that these two-storey masonry structures are chambers whose medieval hall has been lost. Boothby Pagnall, Lincolnshire, was long considered an ‘upper-hall’ (Wood 1965), the English equivalent to the ‘hall-house’, but subsequent geophysical survey and excavation revealed the presence of a lost ground-floor hall (Harris & Empey 2002). The chamber at Boothby Pagnall bears more than a passing resemblance to Annaghkeen Castle, Co. Galway (Figs. 12 & 13). Furthermore, it became increasingly obvious that a number of well-known castle sites, typically identified as having a ‘hall’ at first-floor level very overtly adhered to the plan of separate hall and chamber including Athenry Castle, Co. Galway (Fig. 9) or Adare, Co. Limerick (Fig. 10). Inspired by Blair's theory on halls and chambers, my doctoral research examined the architecture and historical documentation of over one hundred thirteenth-century masonry structures in Ireland that were identified as possible chamber-towers. They contained a large space at first-floor level (and therefore access was restricted) and latrines, a feature absent from medieval halls. Further to this, earth resistance was carried out a number of typical ‘hall-house’ sites including Ballisnahyny and Shrule in Co. Mayo and Annaghkeen, Co. Galway as well as a selection of castle-sties from Co. Roscommon. These surveys revealed sub-surface structures at each site that very likely are medieval halls conforming to the seemingly homogenous castle-complex plan that became ubiquitous across Anglo-Norman Ireland and England during the late twelfth and thirteenth centuries. The re-interpretation of previous information plus this new survey work suggests that like in England, these castles formerly understood as ‘hall-houses’ are in fact chambers or chamber-towers which functioned as the private residential accommodation of the lord and lady. Barry, T. 2010. ‘A bibliographic review of Irish castle-studies’, in Proceedings of the Royal Irish Academy Section C: Archaeology, Celtic Studies, History, Linguistics and Literature. 108, p115- 136. Blair, J. 1993. ‘Hall and chamber: English domestic planning 1000-1250’, in G. Merrion-Jones and M. Jones (eds. ), Manorial Domestic Buildings in England and Northern France. London. Society of Antiquaries of London. Dempsey, K. forthcoming ‘The death of the ‘hall-house’, Medieval Archaeology. Harris, R & Impey, E. 2002. ‘Boothy Pagnall revisited,’ in G. Meirion-Jones, E. Impey, E and M. Jones (eds. ), The Seigneurial Residence in Western Europe AD c800-1600. Oxford: British Archaeological Reports. Hill, N. 2013. ‘Hall and Chambers: Oakham Castle Reconsidered’, The Antiquaries Journal Volume 93, pp 163-216. Manning, C. 2003. Excavation at Roscrea Castle. Dublin: Wordwell. --------------- 2009. The History and Archaeology of Glanworth Castle, Co. Cork: Excavations 1982-4. Archaeological Monograph Series 4. The Stationery Office: Dublin. McNeill, T. 1997. Castles in Ireland, feudal power in a Gaelic world. London: Routledge. O’Keeffe, T. 2013. 'Trim's first cousin: the twelfth-century donjon of Maynooth Castle' Archaeology Ireland 27 (2) :26-31. ---------------- 2013. 'Halls, 'hall-houses' and tower-houses: disentangling the needlessly entangled'. The Castle Studies Group Journal 27, pp. 298-307. I have a lifelong love of medieval architecture. I recently found a home video of myself aged 11 discussing Charles Fort in Kinsale and the problem of calling it 'English' ...... Nowadays my focus is more on medieval castles. I recently finished my PhD at the School of Archaeology in UCD entitled 'Medieval Halls and Rectangular chamber-tower in thirteenth-century Ireland'. My next project is a move towards engendering medieval spaces and critiquing androcentric approaches to medieval architecture.